The Welcome Dinner Project is breaking down social barriers by connecting newly arrived migrants with local Australians over dinner. Each guest brings a dish and shares a pot-luck meal in a local volunteer's home or community venue. Since launching in 2013, over 5,000 people have cooked and shared a dish at a Welcome Dinner across Australia. To see communities become fully alive to the interconnections which lead to a meaningful and sustainable life for the earth and its inhabitants. 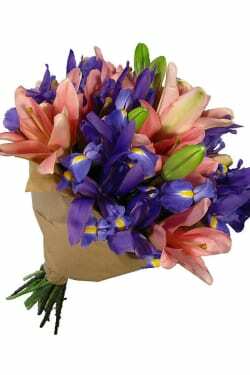 This month, 10% of sales from our Lilies and Iris bouquet will go towards the The Welcome Dinner Project in August. The Welcome Dinner Project is a volunteer and community led social movement that aims to build and foster meaningful connections in communities. We are all aware of the many challenges in our society for newly arrived people and the popularity of this project tells us there is endless goodwill out there to create a different kind of story – one that represents the true “fair go” Australia!